And behold, the star that they had seen at its rising preceded them, until it came and stopped over the place where the child was. They were overjoyed at seeing the star. Having discussed the chronology of the infancy narratives as well as the particular question regarding the time in which the star appeared to the Magi (and, therefore, the length of their travel to Bethlehem), we now turn to the nature of the star itself. As we read the biblical account, it becomes clear that this is no ordinary star. It went before the Magi to guide them, it stopped over the place where Christ lay – something about this star allowed the Magi to recognize that it marked the birth of the Messiah. Indeed, we are led to ponder, Was this a real star at all? While the Bible does clearly call it a “star,” must we believe that it was in fact a real star? Could it have been an angel? Or the Holy Spirit himself? Or maybe it was a meteor? Or a comet? Or was it a vision which only the Magi saw? When we come to such a difficult scriptural question, we must turn to the experts. I do not mean that we should look to modern scientists and biblical scholars, but we must turn to the true experts – the Fathers of the Church, the Church’s venerable Doctors, and the great theologians who have interpreted the text according to the Church’s Tradition. In attempting to give something of an answer to our question, I will rely particularly on St. Thomas Aquinas and Cornelius a’ Lapide – these two theologians synthesize the varying opinions of the Church Fathers, while also taking account of the astronomical discoveries of science. How did the Magi understand the message of the star? It is quite interesting to note that none (or very few) other than the Magi were able to interpret the true meaning of the star. It seems that at least some other must have noticed the star, yet only the Magi understood that this indicated the birth of the Messiah. What is particularly surprising is that the Magi were not even Jewish, and yet they recognized that the star indicated the birth of the King of the Jews! The Church Fathers – Sts. Basil, Jerome, Leo, and Cyprian, as well as Origen, Eusebeus and others – piously believed that the Magi knew Christ was born by the token of a star on account of the prophesy of Balaam. In Numbers 24:17, Balaam said that “a star shall rise out of Jacob.” Balaam was a pagan, from a land to the east of Israel. It seems likely that the Magi were of the same nationality of Balaam and, therefore, recalled his prophecy with particular devotion. Since this pagan nation had only one prophetic message about the Messiah, it is no surprise that the Magi would have recalled it immediately upon seeing the star. The Jews, on the other hand, had received many prophesies about the Christ, hence they did not recall this one about the star until later. Moreover, we must maintain that the Magi recognized the true meaning of the star not merely from Balaam’s prophecy, but also from an internal movement of the Holy Spirit. They knew by a divine instinct and revelation, for the Magi were endowed with a hidden celestial afflatus. This is the opinion of St. Augustine and other Fathers – it is also the opinion of St. Thomas and of Cornelius a’ Lapide. Was it really a star? Some hold that the star was, in fact, the Holy Spirit himself; but others believe it to be an angel – so Origen, Theophylact, St. John Chrysostom, and Maldonatus. Others hold that it was a real and new star, created simply for this one purpose – so St. Thomas Aquinas and St. Augustine. Moreover, others hold that the star was a comet – this seems to be the revelation given to Bl. Anne Catherine Emmerich. We, however, will maintain (with Cornelius a’ Lapide) that this star was not a star at all, but something of an entirely different nature. Neither was it a true comet, nor a pure angel, nor less the Holy Spirit – we will show this from the nature of the star itself. The star was entirely different from other stars and also from comets. 1) It was produced upon the very night of Christ’s Nativity and vanished after the Magi arrived in Bethlehem (so St. Augustine). 2) It was not as the other stars are, far above and away from the earth, but it came down low near the earth, so as to indicate the very house where the Child lay. Hence, it is clear that it was not a true star (a burning ball of gas, billions of miles away). 3) It did not move in the pattern of the other stars, but guided the Magi and went before them. Moreover, neither did this star move according to the pattern of comets – for this star proceeded according to the speed of the Magi. 4) This star shown both day and night, but at other times vanished (when the Magi went to Jerusalem to ask where they should go next) and then re-appeared (when the Magi went from Jerusalem to Bethlehem). The other stars shine only at night and do not appear and vanish and re-appear. 5) Moreover, the peculiar nature of this star is witnessed by its brightness (which far exceeded the other stars) and its size (for though it was smaller than the others, it seemed larger since it was so close to the earth). 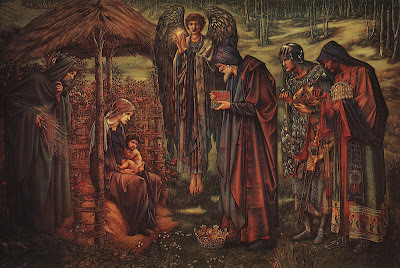 The Scriptural account witnesses to these peculiarities: For the star goes before the Magi as if guiding them (hence it does not follow the pattern of the other stars), it stands out from among the others to be recognized by the Magi (by its splendor and size), and it indicates not merely the city but even the very house where Christ lay (hence, it came down low to the earth and rested directly over the place). Moreover, in addition to the Scriptural account, we have the witness of the Tradition which is very nicely summarized in several Christmas carols. From all this, it is clear that this “star” could not have been a real star. The simple fact that it indicated so directly the place where Christ lay tells us that it could not have been a real star – for no star could indicate so specific an area by shining from billions of miles away, yet if any star were to draw close to earth and indicate the place directly it would surely destroy the whole planet (since stars are far larger than earth and are very hot). No, this was not an ordinary star! Therefore, it seems that the many books and websites which attempt to plot out the star of Bethlehem according to astronomic charts are misguided. This “star” appeared just long enough to indicate the Child, then it disappeared all together. It left no record, other than that which is preserved in Scripture and Tradition. As it was not an astronomic reality, it would have left no data for later astronomers to discover. Then what was the star of Bethlehem? The closest parallel we have to the star of Bethlehem is the pillar of fire and cloud which led the people forth from Egypt – so St. Thomas and Cornelius a’ Lapide. Just as the pillar of fire and cloud led the Israelites, so too the star went before the Magi. Just as the pillar changed its form and appearance, so too the star was sometimes visible and sometimes hidden. Indeed, the pillar was a foreshadowing of the star – so St. Basil, St. John Chrysostom, Fulgentius, and others. Therefore, by analogy to the pillar of fire and cloud, I maintain (with Lapide) that the star was formed of condensed air and dust, with brightness infused into it by the angelic powers. 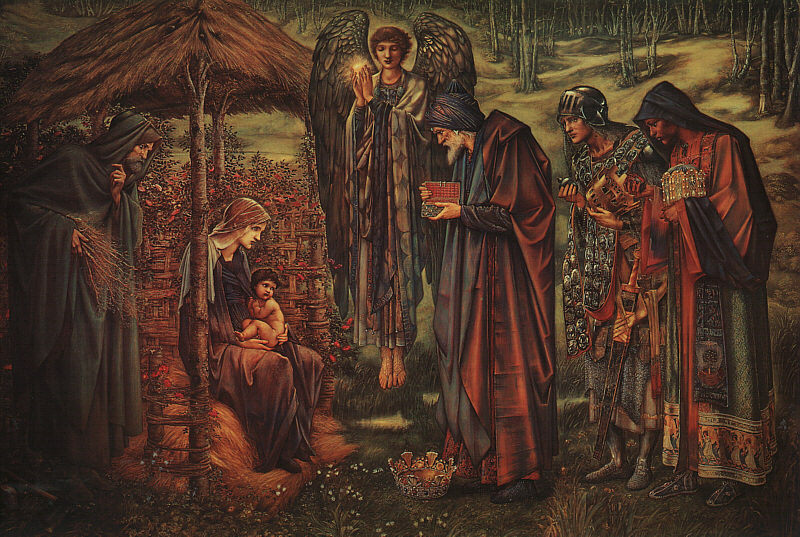 It appeared like a star, but was in truth a newly formed mass which was moved by the angels as a guide for the Magi. As Almighty God had liberated his people Israel from slavery in Egypt through the pillar of fire and cloud, he has now liberated the gentiles from slaver to sin by the guidance of this star. (Here I go again following blogs when I should be spending time with Holy Scripture, Prayer and the Church Fathers, not forgetting the Catechism...I say all this in light jest). In the post by Fr. Iosephus, I note Holy Church's reading for Mass being Eph 3:2-3a,5-6 and some of the connection Prosper Gueranger and the "Catena Aurea" pointing that the Magi would know the prophecy of Baalam and would be awaiting its fulfillment. What I was and still am unsure of is how Paul would have understood that in light of Eph(above). Would he have not counted that the Gentiles were brought to salvation in the mystery of The Magi or am I totally of base....James' reply to me in that post suggested I was missing the point of the Epiphany. Arrrgh.....to have some holy guidance would help. My priest said the scientists theorize The Star was a supernova. I am trending to your thoughts here given what I have read from St. Thomas and Gueranger. I tried to research into Lagrange but came up empty...Oh were he alive to enliven us all. Well I must off to pray...study...and read some of St. Thomas on The Apostle's Creed. Please pray for me as I do pray for you. Ernie, Christmas blessings to you! The Magi are indeed the firstfruits of the gentiles to be grafted onto the Jews. I think that Paul is speaking more of the reconciliation of all the gentiles which is made possible in Christ's death (for he died "outside the city walls"). Thus, the Gentiles are all potentially present in the three Magi, but the possibility of their salvation is not actualized until Christ's death on the Cross (and each individual's faithful adherence to Christ). I don't think that you are too far off, so don't be discouraged! Indeed, you have begun to "dig into" the mystery a bit ... that is a good thing, even if "we see through a glass, dimly." Blessings for your study and prayer! Interesting explanation. Arthur C. Clarke, noted atheist (so sad), in one of his earliest stories, has interstellar Jesuit scientists travelling to some distant solar system and determining that the Star of Bethelehem was actually a supernova. Just for a sort of non sequitir addition to the conversation! Thanks for your words of encouragement. Again your parallel to the pillar of fire makes a lot of sense. On a side note, in my readings of Garrigou-Lagrange, I ordered "Reason With Piety" by Fr. Aidan Nichols. In doing a bit of research on Fr Aidan, I've found he has written some on The Epiphany. One excerpt below is a good insight and draws a connection to the Song of Songs. In my limited understanding on much of Biblical prophesy and foreshadowing, I did not make the connection in the Song of Songs as held by St. Bernard and preached by the Cistercian Guerric of Igny. Again it follows and is extracted from Fr. Nichols writing "Epiphany". Prayers and blessing. Please pray for me. As one gets older there is so little time and the business of day to day melts most time away. The Most High himself ... came down to his mother's womb, he who always abides in the bosom of the Father, with whom he lives and reigns through every age." "Guerric accepted Bernard of Clairvaux's proposal that the Son's union with our flesh is the true meaning of the kiss offered by the divine bridegroom to Israel in the Song of Songs; the incarnation fulfills the articulate hope of Jewry and of the dumber longings of humanity at large. In his sermons Guerric celebrated that union in a series of contrasts. The Ancient of Days becomes a child; the God of majesty empties himself. Here we see a speechless infant; yet he gives all eloquence to human tongues. He comes before us as one who knows nothing; but he is God's Wisdom and Word, teaching knowledge to human beings and angels. The child wrapped in swaddling clothes is he who is robed in light boundless and unapproachable." Howdy all. It seems to me that your preoccupation with this question just shows how much you've been influenced by the historical critical method. Perhaps a true ressourcement is required? In all respect, I must say that you have made a very silly comment! In what sense is it a sign of being corrupted by the historical-critical method that I should want to read the Scriptures carefully? Moreover, as you should have noticed, I am following the opinions of the Fathers and Doctors of the Church...they spend even more time on the subject than I have! I would offer that your aversion and suspicion just shows how much you've been influenced by the historical critical method (which you over-react against), and by Protestant fundamentalism (which you begin to fall into when you think that asking serious questions when reading the Bible is somehow not Catholic). In any case, any who have been reading my Thomistic Scriptural Commentary Series will certainly be amused at the thought that I am following down a path that will lead to (or has come from) the "historical-critical" method. ..."Ressourcement" means getting back to the sources...please explain how I have done anything other than that in this little commentary [if, indeed, you are at all familiar with the sources yourself]. throughout Bible history as he visited and dealt with men of faith. The learned call this a Christophany; in the Garden of Eden, walking with Enoch, conferring with Abraham, in the fiery furnace, etc., that Person communicating God's presence, protection, provision. Do not all these attributes fit the mission of God's Holy Spirit, at the birth of the Christ-child, and drawing those scattered, not gentile, but Jewish magi, whom were seeking a prophesied Messiah. Wise men still seek Him! After proclaiming the the birth to the shepherds, the Holy Spirit ascended to a very high position above the Earth (at 40,000 feet one can see approx. 244 miles in any one direction), taking into consideration a 2 year journey via caravan, would mean a position in outer space, but not deep space. As the magi, used triangulation to move toward their goal the Holy Spirit descended to a point where scripture states, the Star stood over the child. Jesus would have been a toddler at this event, which counters tradition's romantic scene of the magi at the manger. An interesting point regarding their gifts to Jesus is that the gold was appropriate for a king, and the frankincense and myrrh were fit for a dead man.